Most commercial G Scale locomotive models are decent representations of DSP&P prototypes. Unfortunately, they have appeared in three different scales (1:24. 1:22, and 1:20) so they don't always look right when parked side-by-side. Some of the rolling stock on this page never existed on the DSP&P, but are figments of my construction foreman's imagination. 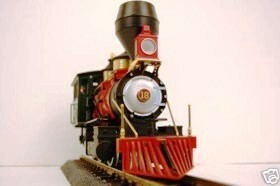 Above is a headshot of the LGB model of DSP&P Mogul #18. 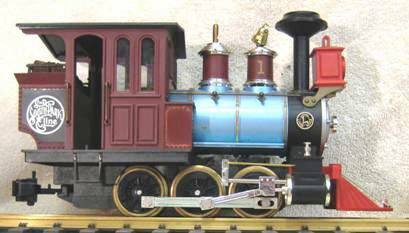 The model is of a more modern Cooke built Mogul, but few could tell that it is not the earlier Dawson and Bailey version. concept of it as a 0-6-0T used for yard switching. This HLW 4-4-0 is the closest G Scale model available to represent "Platte Canyon". Other models are too large. might pass as a Mason Bogie. DSP&P #3 was really named "Oro City". closer to the Cooke models of 1884. 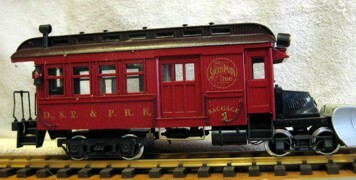 Most of these models were painted black as DSP&P #191 as restored. Backdated paint scheme is very rare. This LGB's most realistic version of the 2-6-0 Mogul in DSP&P livery. after the transition to C&S ownership. DETAILS ONE OF A KIND: Preproduction model by David Fletcher for Aristocraft, never produced. Lowered chassis, custom paint. Photo by David Fletcher. LGB Digital sound added.